Sunday February 11th, the Newburg Vol. 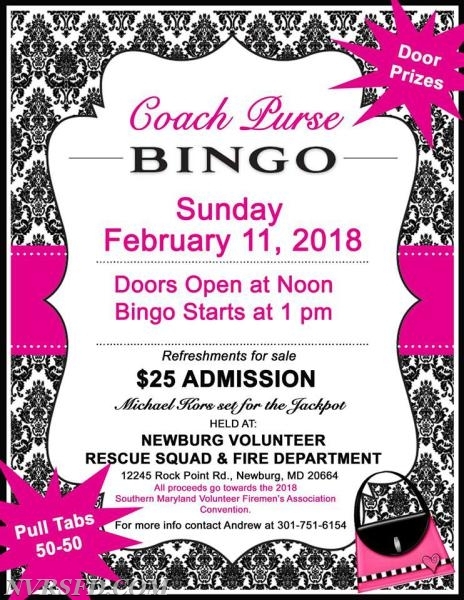 Rescue Squad and Fire Department will hold a Coach Purse Bingo to support the upcoming 2018 Southern Maryland Volunteer Firemen's Association Convention! Admission is $25, which includes one of regular games - and one each of specials including a jackpot. Additional books for sale at $5 each, and additional jackpots at $1 each. There will be a 50/50 raffle and pull tabs for sale! Kitchen will be open! Doors open at 12:00 noon, and Bingo starts at 1 p.m.! For more info, see the flyer below or contact Andrew at 301-751-6154!